Thank you LIVE for dragging me around the Downtown Eastside (DTES) on Wednesday night, even though there was a heavy rain warning and I was depleted of energy, lacking adequate sleep and some other personal needs. When I began the evening by joining the gathering outside of 221A, I noticed that the LIVE family was looking similarly depleted, of sleep I supposed. As everyone knows, LIVE is not a festival to sleep through. Performance art by its nature is a demanding participatory form: the audience is, in most cases, heavily implicated in the completion of the work. At its best, performance art produces an emancipation for the crowd (Ranciere). On-lookers are always tasked with the job of re-telling of the live (lived) experience, no matter how much subsequent documentation eventually becomes available. The LIVE Biennial in Vancouver is very successful in developing an ethic of art-making that is situated within a responsive audience that is in turn productive and generative of the art. In Wednesday’s “the Drag” event, the audience, as well as the location, were vital agents in a set of works that were access by way of a directed walk. The emergence (re-emergence) of highly active studio, exhibition and living spaces for artists in the DTES was the initial curatorial motive for the event. Following this impulse, the evening’s work reflected the creative tension inherent in art that is currently being produced in the most economically impoverished, yet politically charged neighbourhood in Canada. When I arrived at 221A, Golboo Amani, in the peformance Stained, was kneeling at a basin of Henna mud which she was using to crudely cover her naked body. No sooner had she covered every reachable surface, than she began to wipe it clean with a sponge and water from another basin. This was quietly, and deliberately repeated about five times. Increasingly the Henna muddied everything: the clean water, the mat, the floor and the clean towel that was waiting for her final cleansing. It was a pervasive and clumsy task that contrasted dramatically with the beautification expected of the Henna process, and the austerity of the immaculately kept white gallery setting. The placement of her brown body in the centre of the room, which had just hours before held an exhibition about racial identifiers carried by artists in Canada (F-F Granados’ I Heart Canada & Canada Hearts Me), was exquisite. The esthetic distance that was intensified by the glass door and windows between us and Amani, served in this case to create a respectful awe that, more than the door and windows, shielded her from the unpredictability of the passersby. Racial muttering from an individual was silenced and shunned, as the crowd negotiated the proud vulnerability of this deliberately coloured and un-coloured woman. 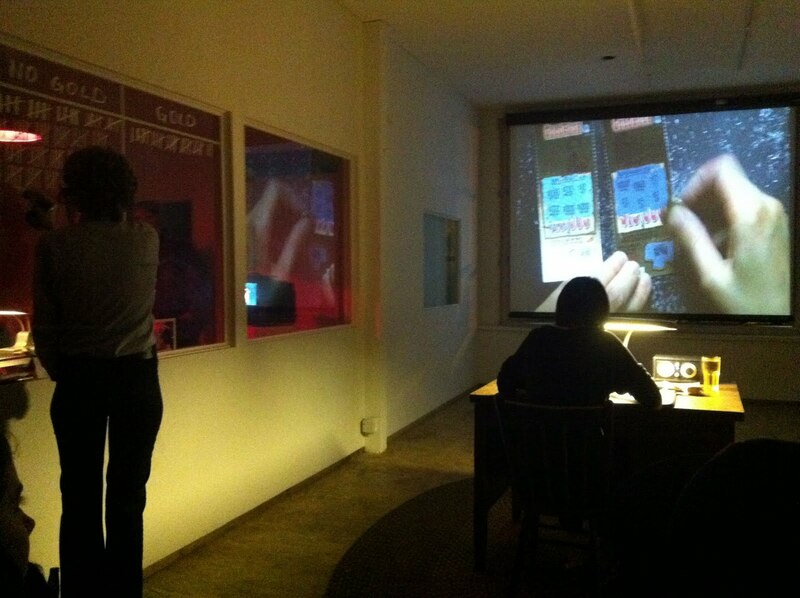 DRIL’s GOLD RUSH was performed in an occasional exhibition space of Drop Out Video Art (DOVA). Again the site-specificity served the work well. Positioned behind the performer who was seated at a neatly arranged old desk, we were forced to watch a live projection of her hands monotonously, but pretty compellingly, scratching out a big stack “$1 - Gold Rush” scratch & win lottery tickets. Next to her another performer kept a tally on a glass window. I should be recording the final tally here, as a verification of the BC Lottery Commission’s posted odds (“Overall chances to win a prize on a $1 - Gold Rush are 1:5.09” http://www.bclc.com/app/ScratchAndWin/Home.asp). DRIL had gambled their LIVE artist fee on this performance. What I learned from the half-hour that I watched was that there was indeed a 1 in 5 win, but that the majority of wins were for only $2. So in this test case, the BCLC was keeping about $3 on every $5 (of Canada Council ? dollars spent). It was fun to climb up a narrow staircase and crowd into a DTES rental to watch the spectacle of paltry sums of cultural capital flowing back into the coffers of the provincial government. Cruz Brothers performed a mini-festival-within-a-festival on the elevated patch of grass in the mini-gathering space of Pigeon Park. Staged as a very short-lived 5-ring circus, Five Minute Festival was a tableau of live art, which started and stopped at the command of circus master, Francis Cruz. The audience had a number of ways to interact, including playing a few rounds of scruples with a masked barker, or by walking around the carnival, or by standing back and wondering how annoying these five minutes must be to those resting on the benches that lined the stage. Over in a flash, it was like a short, self-reflective gaze on the more imposing aspects of site-specific performance art. At Shudder Gallery, we were jammed into a basement to watch Stacey Ho with the support of Jess Butler as they wrote and then washed away wall texts about Algeria and Orientalism (Manifesto of the 121, Assia Djebar, Jean Genet...). Algerian White was a pretty constricted piece that made me wonder how pained the artist Stacy Ho was in her reading of the texts. There was no liberation here. It was hot and most of the crowd could not endure the writing and the washing to the end, at which point the ink was consumed, the pages were soaked, and then they were laid wet on the floor. Later in the gallery above, Femke van Delft and Dave Chokrun in Playing War Games attempted to give a few live bees some liberation within the inside of the artist’s head gear. That doesn’t make sense, does it? The bees were in mason jars that the artists wore around their necks. Once the artist’s heads --including the mason jars-- were covered in netting, the lids were removed. It wasn’t much of a liberation, and from what I saw, none of the bees took up the challenge of a slightly enhanced range. But what was interesting was a strange set of instruments that Chokrun used to produce music and van Delft use as a light piece. Built from materials that remained of an enormous bee hive that was once alive in an “abandoned” miner’s hut, the sculpture included a very old (rotting) keyboard with a beeswax form in the place of a screen or CPU, all atop a distressed metal table and chair. The chair was played by Chokrun using a set of bows, while the lights of the desk were controlled by van Delft. A DTES artist who walked with me from Shudder to the next site, did not understand the connection of the bees to the improvised music, and concluded that this did not meet his expectation of “art”. I think that his was a harsh critique, since the work was sculpturally and aesthetically cogent. But perhaps local critique is what “the Drag” in its concept and site-specific form was hoping to consider, so I think those comments are worth recording. I appreciate the frankness of that guy on the street. He was certainly enacting the emancipation which this kind of event expects to produce. I also think that all of us in the crowd appreciated the frankness of the other guy on the street who disrupted Guadalupe Martinez’s conclusion to her day-long walk through the streets around The Gam Gallery. For SECOND WALK: Assembled meanings for home she had spent the day (and days) leading up to the performance gathering bits and pieces from the decaying and dis-regarded environs. She seemed to be collecting things that --like Benjamin’s Dialectical images or objects-- held some kind of an ecstatic charge. Her late-night performance in the gallery concluded what was a kind of ordeal with a live re-arrangement of the broken bricks, fencing, sticks, paper crown, small stones, feather... She was finally offering to the place and the things, a song: La Pomeña (an Argentinian folk song, popularized by Mercedes Sosa). While she was singing, a forceful voice from the street yelled into the room a declaration of this being NATIVE LAND. Randy Gledhill, LIVE’s artistic director, returned the shout with an invitation to the intruder to participate, but that that he would have to “shut up” and listen. That set off a predictable diatribe. Martinez quieted her song in the midst of this, but then returned to it without hesitation. It was an enormous tribute to the place, its dispossession and the possibilities that it carries for the artist. La Pomeña tells the story of the “poetry battle” or the “coplas” traditional of rural Argentina. In the story, the beauty of a muse, Eulogia Tappa, and her intense affiliation with the disenfranchised land becomes a common motive for two duelers to produce an heroic utterance. The resulting song monumentalizes the beauty of rural women, and especially their connection to the place. Martinez’s ability to offer deep respect for the place, despite her displacement, and obvious attachment to rural Argentina, produced the kind of resolution to the nomadic evening that the crowd of local and international audience could understand and appreciate. The DTES is indeed NATIVE LAND, and it is also the land upon which many of us project our histories and imaginations. It seems to me that DTES residents, the LIVE Biennale, and some of Vancouver’s most energetic and productive artists are very well situated for endless “poetry battles” that happen also to be a tradition within these streets. Just Announced: Robin Brass Performance Details.